February already! Where did that month go? Like many football matches, winter is very much a ‘game’ of two halves. During the first period, Christmas, parties, holidays, seasonal food, lychee martinis and Winter Pimms all help to ease us through to New Year’s Eve. Now what? A lot of what I see on Facebook includes people complaining about fatter, poorer versions of themselves facing a bleak, rainy start to the year – suddenly belated hibernation seems like a great idea. So thank heavens for cultural diversity! Various festivities give us something to spice up what’s left of winter, starting with last week’s Chinese New Year. 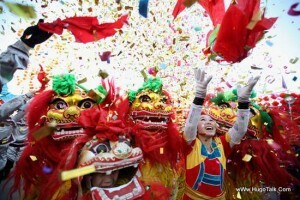 Gong Xi Fa Ca to everyone still celebrating! I didn’t go to Chinatown for this year’s celebration, and last year’s lanterns are still wrapped in their cellophane. I only remembered about them this morning – bought as I wandered around China Town with Dr Patrick, sploshing about in 2013’s puddles. Sunday also saw the celebrations for Hedgehog Day! Not sure what the traditional fare is for that, so I made do with a large box of Thornton’s mint chocolates. Other weird upcoming festivals in which to enjoy some sparkling pink wine and possibly some 80’s disco include Imbolc, a Celtic festival dedicated to the forthcoming lambing season. It also incorporates something to do with holy wells; quite appropriate following my recent stay on a sheep farm and visit to Holy Island! Also, Lupercalia (which, annoyingly, makes a little voice inside my head sing supercalafragilisticexpialidocious). It’s the ancient Roman festival of purification, believed to be the origin of the activity we know as ‘spring cleaning’ – so not something I’ll be rushing to celebrate. Wine flowed and I was a little greedy with the canapés at the Truly Me event for Women Entrepreneurs at Earl’s Court on Thursday night. I gave a 40 minutes presentation on how small businesses can benefit effectively from social media, to a bunch of lovely, talented and enthusiastic female business owners. It was wonderful to meet a new crowd of networkers, and see people promoting a range of products and services from wardrobe styling through beautifully patterned umbrellas to happiness counselling! I was approached to speak at the event via LinkedIn, so it made sense to spend extra time demonstrating its benefits. Used correctly, LinkedIn allows professional people to search out the skills they need to fill certain gaps: I was sought to talk about social media marketing via my profile headline. I used one of my accountancy clients as an example of a well-constructed LinkedIn profile and a few people actually expressed an interest in getting in touch with him on the basis of that. Well, he was named as one of the UK’s top new accountants in 2013 and listed as a Top 35 under 35! I would also tell you that someone in the audience thought he was hot, but that will embarrass him if he reads this!! This week marks 31 years since the tragic loss of Karen Carpenter, but that’s not why I’ve chosen these lyrics today. Some of you will know why… “On the day that you were born the angels got together, and decided to create a dream come true; so they sprinkled moon dust in your hair of gold and starlight in your eyes of blue.” I can’t make all your dreams come true but I can certainly help with your business ones. 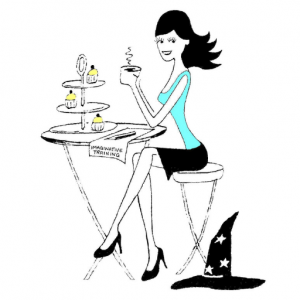 Call me if you’d like help marketing your business on line, or follow me here@ @WeekendWitch.